It's already night and my soul feels as never before that it is the night of love, that it is the most holy of nights. Jesus will depart yet He wants to stay among us. What an entanglement of love, what are the ties of His Heart to the hearts of those who are dear to Him! What anxiety between going and staying! My heart experiences all this. I am bread, I am wine, I am the host, I am the tabernacle. What a rich night, what beautiful night! The angels descended from heaven to worship so great a mystery. But, oh, what awaits Jesus! What treachery, what false traps surround Him! I see Gethsemane, I see the blood: everything is silent, so that only Jesus hears and feels. And what unconcern of those beloved of His Heart! Little do they understand the pain and grief of Jesus. We were today at Balasar when it was about ten o'clock. The weather was cloudy and threatening rain, but there were plenty of people, especially in the church. We learned that the pilgrimage of the Alexandrina Society came last Saturday, when also came another which included people of Croatia. Please pray for the canonisation of Bd Alexandrina. Now that we are on the way to the 13th, let’s read this brief dialogue between St. Therese of Lisieux and Blessed Alexandrina from the Sentiments of the Soul 3 October 1947. St. Therese promises that will meet Alexandrina in her “passage to eternity." 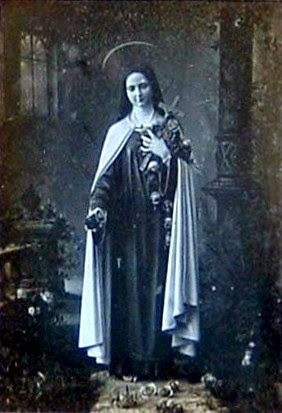 St. Therese came dressed in light, with a very nice diadem. As she was beautiful and kind! - My Sister, wife of My Spouse and daughter of my Lord, have courage! Great glory awaits you in heaven! What a beautiful crown made ​​of your martyrdom! Suffer with joy, you have my protection here on earth and I’ll meet you in the passage to eternity. - St. Therese, my dear St. Therese, I trust on you, I count on your protection, love Jesus for me and Blessed Mother and the whole Trinity. Image of St. Therese that exists in the Alexandrina room and which is photograph of the sculpture existing in the Póvoa’s Church of Mercy. The life of Spanish mystic, author, reformer and Doctor of Prayer St. Teresa of Avila is looked at in detail in this biographical film presentation that is suitable for all. St. Teresa’s early life, devotions, trials and decisions as well as her novitiate, conversions, development of prayer, her reformation of the Carmelite Order and much more are here carefully presented. St. Teresa’s natural qualities, humour, devotion and writings attracted and inspired many during her lifetime and continue to do so today. Good humoured, determined and deeply in love with God she is a great example for all. Sacred art, paintings, photographs and maps of Spain, a simple costumed visual, scenery, narrative and music combine to present a creative, detailed and devotional film presentation of the life of St. Teresa of Avila. The writings of the great mystic St. Teresa of Avila are indispensable for the study of Blessed Alexandrina. 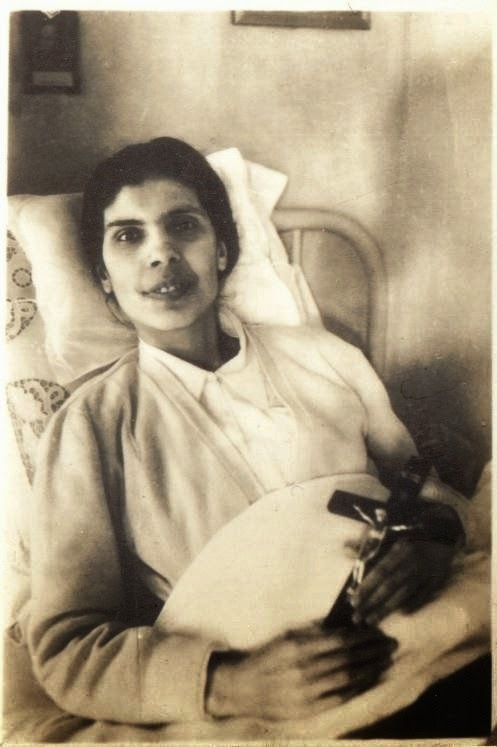 One of the last photographs of Blessed Alexandrina.